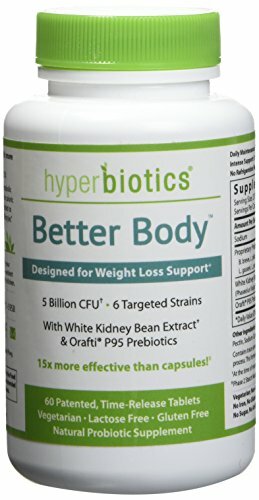 Is Hyperbiotics Better Body the right supplement to help you lose weight?Hyperbiotics Better Body is designed to help you achieve your optimal weight. The 6 targeted probiotic strains in this formula (along with White Kidney Bean Extract and Orafti 95 prebiotics) work to promote a healthy metabolism, support balanced blood sugar levels, and support digestive, metabolic, and immune function. White Kidney Bean Extract acts like a starch blocker and has been clinically shown to reduce the digestion and absorption of carbohydrates by up to 66%. It helps turn the starch you eat into absorbable sugar, which can lower your glucose response and glycemic index. In other words, White Kidney Bean Extract makes the carbs in your life less likely to upset your best laid plans for healthy weight loss. 6 TARGETED PROBIOTIC STRAINS - (including Lactobacillus and Bifidobacterium) to effectively counter the indiscriminate effects of today's broad spectrum antibiotics and other lifestyle choices that can deplete the microbiome. WHITE KIDNEY BEAN EXTRACT - clinically shown to reduce the digestion and absorption of carbohydrates by up to 66%. This in turn, reduces the caloric impact of any starchy foods you eat and lowers your glucose response and glycemic index. ORAFTI P95 PREBIOTICS - have been shown to support weight loss by encouraging your probiotics to set up shop and thrive in your gut. In short, prebiotics are to probiotics what fertilizer is to a garden. LONG SHELF LIFE & NO REFRIGERATION NECESSARY - With the patented LiveBac manufacturing process, we offer a guaranteed shelf life of 18 months from the date of manufacture. Most probiotics don't provide a date of any kind because their organisms die so quickly after being manufactured. MADE IN THE USA - Our probiotics are homegrown with care in Washington state then tableted in Colorado in an NSF and GMP certified facility. We adhere to the strictest quality control and FDA guidelines and perform rigorous testing on every lot to ensure they are effective and as the label states.